Oil sLick is Muddy River Technologies’ proprietary oil skimmer that efficiently removes floating oil while taking only minimal water. Oil sLick can be used to clean up oil spills or recover free oil from industrial wastewater. Oil sLick’s perfectly weighted ring intake weir floats on either fresh water or salt water so just a small volume of oil and water flow into the collection cup to be pumped to oil/water separation or to storage. 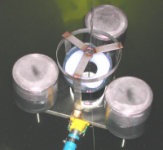 The intake ring is supported by floats to provide a stable and buoyant platform. Compared to oil absorbent pads, Oil sLick is compact and unlimited capacity, Oil sLick recovers free liquid oil as a potentially useful product rather than needing to manage soiled pads as a hazardous solid waste for disposal. Oil sLick comes in a range of sizes, with capacity limited only by pumping rate.